So, we’re one month into the New Year (and if you observe Chinese New Year like I do, we’re also right at the beginning of another New Year), and this means it’s probably a good time to reflect on one’s New Year’s Resolutions so far. Or, in my case, mini-resolutions so far. And, of course, if we’ve learned anything from them. As mentioned in my previous blog post, a ‘mini-resolution’ is a very tiny, very specific, very achievable action or goal that you commit to for just a small period of time, rather than a huge, grand goal you supposedly aspire to for the year. So rather than, for example, declaring ‘My New Year’s Resolution will be to lose weight in 2014!’, a mini-resolution would be ‘I will go to the gym once a week for the month of January’ or ‘I will make myself eat three sticks of celery every day in a bid to eat more healthily’. Yes, they seem like tiny, tiny, almost insignificant actions to commit to, but it’s better than committing to lots of huge changes at once (e.g. going to the gym three times a week when you’re not normally in the habit of going to the gym at all; completely overhauling your diet when you’re used to eating junk food twice a day) only to find you fail just a few days or weeks into the new year. Tiny habits, tiny actions, done on a regular basis – are in my experience – a much better way to go. Tiny habits, particularly if you can make them tiny daily habits, may well be frustrating especially as you won’t see the results of your work as quickly as you would like – but regularly-performed tiny habits form the basis of long-term change. Tiny habits are easier to build on, than trying to make several huge (and often overwhelming) changes all at once. Tiny habits keep you going, rather than making you feel like a failure for not achieving that huge change you declared at the start of the year. And, should you not stick to the tiny habit or action you committed to over a short period of time, tiny habits are easier to pick up again when you want to start over. Of course, someone else’s ‘big change’ will be someone else’s tiny habit. So it’s important to find a tiny habit that works for you. As an example, every Lent I completely give up refined sugar: no sugar in my tea or coffee, no cakes or sweets… and it even extends to no ready-meals, nor foods that have a high sugar content that isn’t immediately obvious, such as pizzas, microwaveable curries, and even some supposedly healthy salads that have a high-sugar dressing. Now, I’m quite used to doing this for seven weeks a year by now, and I’m even quite used to planning my life around cutting out several major foods when I do it – it does mean I have to cook and prepare more meals from scratch, and it does mean eating out with friends and going to parties can be tricky, but so far I’ve managed to cope – so for me, giving up all refined sugar for the whole of Lent isn’t really a big deal (hint: take it one day at a time). But for someone else, that kind of goal would understandably be pretty huge, not a tiny habit; and so for them, perhaps their ‘tiny habit’ should be something like simply giving up having sugar in their tea or coffee every day. Or, if even that proves to be too much, giving up having sugar in just their first tea or coffee of the day. So, yes. A few tiny habits are the way to go, rather than trying to make many big changes. In short, mini-resolutions (and sticking to just one or two at a time) are the way to go, rather than grand New Year’s Resolutions. And if any of you have failed already with your New Year’s Resolutions, think of it this way: with the Year Of The Horse having just begun, you have another chance to make mini-resolutions this time that might be easier to stick to. 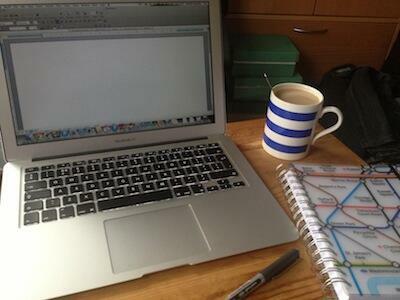 writing (and posting) blog posts DO count towards the 500 words a day challenge. And as you can probably guess, writing this blog post was indeed supposed to count towards my minimum of 500 words for the day. It’s the last day of the challenge, and the last day of January: I have to go out with a bang somehow! So how did I do? Well, in short, much better than I expected. I managed to write a minimum of 500 words a day for the whole month of January (including today) EXCEPT for one day – the 24th. See, I’d done so well until then, writing a minimum of 500 words every day from Day 1 to Day 23 – but on Day 24, I started writing so late (i.e. at 11:45pm) that even when I typed my fastest I’d only managed 400 words as the clock struck midnight. Yes it was completely my fault for spending the whole day thinking that I, well, had the whole day to do it – but at least I managed to do some writing, rather than nothing at all. I was pretty annoyed with myself at the time but, as Jeff Goins said, all I could do was forgive myself for missing the target – it happens – and start again the next day, without any need to make up for the previous day. Which I did. For the first five days or so of January, I started to wonder if perhaps the challenge I’d taken on was perhaps a little too easy. On Day 5, I knocked out a whole 3,000-word blog post – the previous one, the one I originally wrote on mini-resolutions. But about a week to a fortnight into January, I started having so many busy days out of the house (and therefore away from my desk and my MacBook) that I could only ever spare 15 minutes in which to knock out my 500 words, and I did that by quickly typing out rambling, stream-of-my-own-consciousness random rubbish, because that was all I had time to type. Even though I clearly prioritised getting my 500 words a day done no matter what; even if I only had 15 minutes available in the whole day in which to do it (as Jeff Goins said in his post introducing the January challenge: ‘500 words is short enough that you can usually find time to do it daily, and it’s long enough that if you stick to a schedule, you’ll have something substantial in no time’), I started to feel frustrated at the sheer number of times I was going out. Sometimes in life having a busy social life isn’t always a good thing, and when it prevents you from getting the things done that you really need to get done (or really want to get done) then it’s time to get organised and temporarily put some or all of your social commitments on hold. This is something I struggled with all month. I’d started my January challenge by starting to write a story – to try my hand at writing (and, for once, finishing) my own fiction. So the days where I only had about 20 minutes or fewer in which to write, and could only get my 500 words done by swiftly drumming out random, stream-of-my-own-consciousness rambling, were really frustrating to me. Granted, at least I was writing something, and writing 500 words of complete crap is better than writing nothing at all, but I was really hoping to use this month to actually create something worthwhile – and by worthwhile I mean worthwhile to me, if nobody else. So, I had to learn to say no to unnecessary demands on my time, rather than committing to them and resenting them later. I decided to let myself off from ‘creating something worthwhile’ on Wednesdays, as that’s the day I commute to a client’s office to help edit their weekly magazine (Wednesday is press day, and therefore very busy), and it usually means when I get home I am absolutely exhausted. I still wrote my 500 words on Wednesday evenings – as mentioned above, I’ve never quite managed to master getting up earlier, let alone getting up earlier to get my writing out of the way first thing in the morning – and gave myself licence to write 500 words of rambling rubbish if that’s all I had energy for. By week 2, I was often too tired to do even that – but I am glad I forced myself through it, as missing one day could easily have turned into missing two, then three, then four… and before you know it, your tiny habit has been broken. The most important thing you can do is keep going with your mini-resolution, even if your ‘keep going’ means not doing it very well. At least you’re doing it at all. This is another reason why tiny, manageable habits on a regular basis work better – because you will get days where you are so tired, ill, emotional or brain-dead that even the tiniest habit will look nigh on insurmountable to do… and on days like that, it’s even more important to push yourself through and do them. To commit to doing them no matter what else is happening, and just find a way to get it done. Oh, believe me, they will. And at the most inopportune times as well. Illness, personal problems, computer/internet problems, writer’s block – you name it, it all cropped up after the first week. OK, so I never had any absolute disasters (like, say, hospitalisation) but it was like Life tried to inconvenience me as much as possible. So much so, that it almost started to feel as if someone or something unseen was deliberately shoving them in my way to test my resolve. I read somewhere that if you can keep up a new habit for three weeks, then it really does become a habit. I’m not sure I’m entirely convinced; I think you have to do it longer than that. Week 2 was particularly horrible, thanks to having writer’s block for almost the entire week – sometimes the only way I could get my 500 words done in a day was by typing out a 500-word rant bemoaning the fact that I had writer’s block – and while Week 3 went better, I started writing my 500 words so late at night that on Day 24 I didn’t even get 500 words written as the clock struck for midnight and the beginning of Day 25 (as mentioned, I wrote only 400 words on Day 24). After that, I was much less complacent; and readjusted my habits to start my writing earlier, so that I’d have met my target way before midnight. The final week of the January challenge went much better. I always planned my day every day in January around getting these 500 words a day done, and by the final week it started to feel almost natural to do so. I actually created new things that I felt really happy with, and exceeded my 500-word target a few times. I told myself to do this challenge for just the month of January, and then I can relax… but I’ve realised I’m actually going to miss doing it. It gave me a sense of purpose for the whole month, and I loved it. Also, doing this challenge every day – resolving to do it every day, no matter what – has actually had positive effects on me that I didn’t expect. My writing got better, and it got easier to push past writer’s block. I didn’t procrastinate as much. I feel calmer and happier. I really enjoy what I’m doing. My imagination and creativity has started to flow again. And I started to really fall back in love with writing again. Lesson learned from January’s mini-resolution: Tiny, daily actions have a cumulative effect, and turn out to have many other positive benefits in ways you won’t expect. So, with the first day of February about to start, I can stop now. I don’t know whether I should, to be honest; while I feel relieved and proud that I made it to the end of the challenge, while I feel glad I can stop now, I also know there’s a part of me that actually doesn’t want to. I’ve started to really enjoy doing this 500-words-a-day challenge, and I fear that if I stop now, then I’ll lose everything I’ve gained – I fear that if I stop now, it’ll be hard for me to develop a daily writing habit again. But with it being a new month (and indeed, even a new year – well, a Chinese new year, anyway) it is a good time to make another mini-resolution, if I so choose. But I’m not sure what I should choose to do for February onwards. But I did enjoy doing the January challenge, and I enjoy how productive and creative I eventually was. [EDIT: In the 31 days of January, I wrote a grand total of 24,856 words for the challenge – an average of about 802 words a day.] And I have lessons to take away from it that will hopefully come in useful for whatever else I choose to do for the rest of the year. Thanks for reading. What were your resolutions or mini-resolutions this month, and what did you learn from them that you’d like to share? Drop me a line. Posted on 31 January 2014 by Santhie Goundar. This entry was tagged habits, mini-resolutions, new year's resolutions, the creative life, writing. Bookmark the permalink.